Once upon a time in Indie Rock, all eyes were on Seattle as the major labels arrived to co-op the action. And thus was given to the world “grunge” and “alternative rock” and all was, well, whatever… In the background, it was the great state of Massachusetts that was actually its beating heart, both before and after the uprising that sent a million hair metal bands weeping into the night. 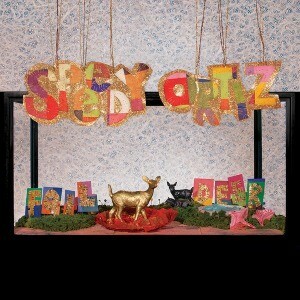 Speedy Ortiz following up their breakthrough debut LP Major Arcana involved some twists and turns. Foil Deer stands as a connector in Boston/Mass. circles, connecting back to the proud lineage of Mission Of Burma and the Pixies, thinking person’s rock both epically brutal, restrained, and seething. Working in new guitarist Devin McKnight and (somewhat) taming the anarchic wordplay, leader Sadie Dupuis has developed short stories with aural soundscapes that match up. “Raising The Skate” is the calling card, with its universal affirmation: “I’m not bossy, I’m the boss…” setting the pace for a portrait of growth on all levels. “The Graduates” is the first sign of a more polished but still ornery band, and their affinity for studio production shines. Amidst the rockers, their greatest magic trick is when they slow things down and find an emotional connection, as they do with the stunning “My Dead Girl” and the closing duo of “Mr. Difficult” and “Dvrk Wvrld.” On the latter, softly churning guitars under the verses up the tension, until the release of the choruses. Throughout the LP, but especially here, the elastic rhythm section of Darl Ferm and Mike Falcone provide an actual swing few other indie bands can match.